At 11:05 am EST Wednesday, Nov. 12, European Space Agency mission control confirmed that the Philae lander had successfully touched down on the comet67P/Churyumox-Gerasimenko. 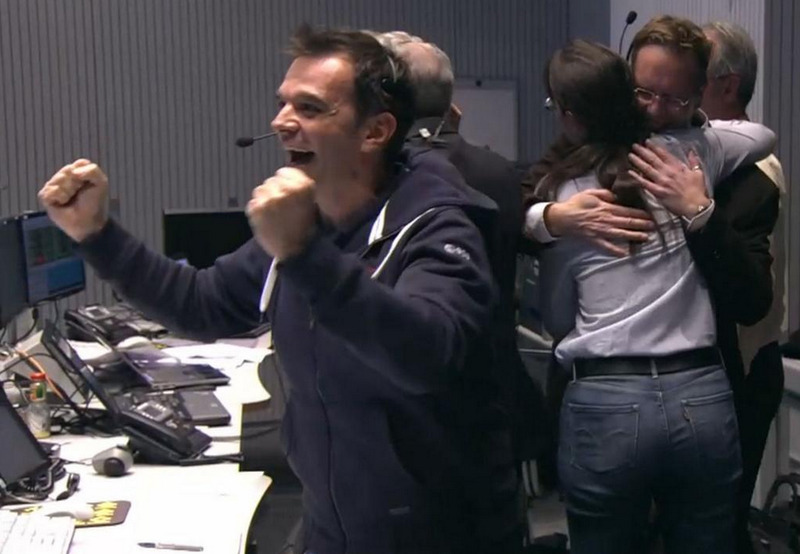 ESA livestream broadcast.ESA mission control room after receiving confirmation. “We are on the comet,” said Stephan Ulamec, the Philae Lander Manager, on the ESA live broadcast shortly after they confirmed that Philae was on the surface. Ulamec confirms the harpoons did NOT fire. There is much they currently do not know. 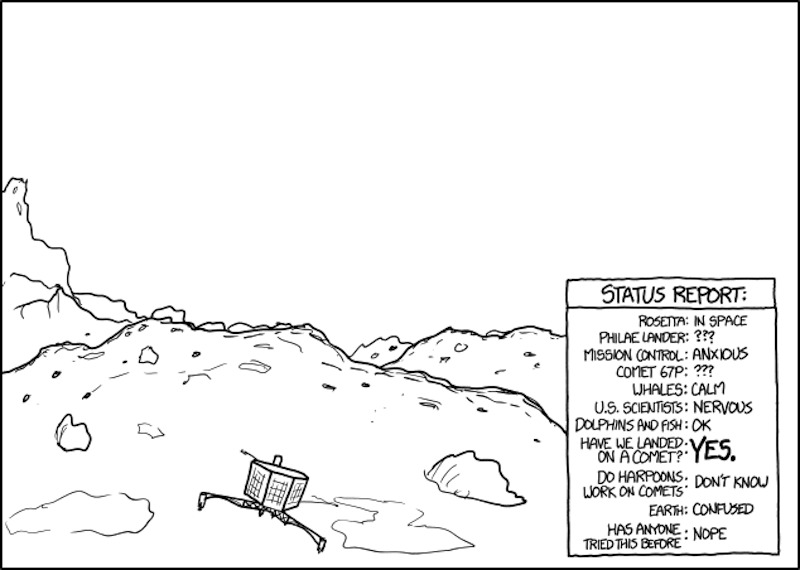 And the signal is “coming and going” suggesting that Philae is unstable and did not attach properly to the comet. When Philae touched down, it was supposed to fire harpoons that would permanently cement it to the surface. This would prevent it from getting tossed off of the comet, which is zipping through space at incredible speeds. 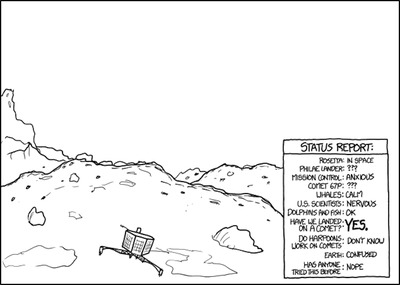 This is exactly how we feel, thanks to Randall Munroe’s XKCD comic. He’s been adding new illustrations through the day depicting the current state of the lander. See the latest. The surface of the comet appears to be soft, which is possibly why Philae has not been able to secure itself. But at least some of the screws on the lander have managed to attach Philae to the soft surface somewhat. Not knowing about the stability is clearly worrisome, but by any reasonable measure Philae is successful, and we can expect good data. Scientists are excited to learn if comets were responsible for bringing water to Earth, which we suspect led to the condition that cultivated life on Earth.